JFS Director Moira Weir speaks before the Hamilton County Board of Commissioners about the effects of the partial government shutdown. Job and Family Services is hardest hit among Hamilton County agencies by the partial government shutdown. Other groups and programs that rely on federal grants could start feeling the effects if the shutdown - already the longest in history - persists. Food assistance cards will be loaded with February benefits Wednesday, but JFS Director Moira Weir is encouraging people to make it last. "That must then last them through the end of March," she told Hamilton County commissioners during an update on Tuesday. "It's their February payment early, but they won't get another allotment until March." Currently, JFS expects March benefits will load to cards on a person's normal date. That means someone who receives their benefits at the end of the month could have to wait up to two and half months for their next benefit. About 100,000 Hamilton County residents receive food assistance. Hamilton County Commissioner Stephanie Summerow Dumas is encouraging JFS to seek help from local companies to help fill the gap, especially as the agency waits to hear what could happen beyond March. "I'm thinking about all the Fortune 500 businesses here in the county that have the ability to help out or assist those who have already been judged to be eligible for food assistance," Summerow Dumas says. "We have so many companies that can provide what the qualification is for the SNAP program; fruits, vegetables and things like that, and not wait for the state or the White House to determine whether or not people are going to get their needs met." Weir says TANF (Temporary Assistance for Needy Families), Medicaid and Child Care funding are not affected at this time. Other Hamilton County agencies and programs could also feel the pinch as federal grants and funding are delayed. County Administrator Jeff Aluotto says that includes Environmental Services, Soil and Water Conservation, Community Development Block Grants and loan programs for small businesses. Citing 2018 numbers, "We would be losing roughly $3 million of new business investment per month based upon the suspension of this program," Aluotto says. "The anticipation would be that that would be backlogged and then moved forward later on in the year, but you also then run into issues of capacity and lending institutions being able to move forward with things." There are also programs in the courts and Public Defender's Office to reduce juvenile recidivism; training and equipment grants for the Coroner's Office; and grants to fund the Hamilton County Heroin Coalition. Those dollars are used for the county's quick response teams (QRT) that aim to get people into treatment after an overdose and other diversion programs. "It especially is aggravating when it comes to the QRT," says Commission President Denise Driehaus, "because it's been such a success ... and to have that now under this strain is just very frustrating." The Sheriff's Office is worried about missing payments for holding federal inmates and deputies not being reimbursed on time for overtime work if they're attached to a federal agency such as the FBI. Union workers from the Covington IRS facility walked a picket line Thursday afternoon, protesting the partial government shutdown. President of National Treasury Employees Union Local 73 Debbie Mullikin says the workers who haven't been furloughed won't be getting paid this weekend. Democratic U.S. 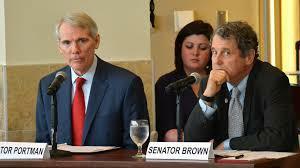 Senator Sherrod Brown of Ohio says discussions with President Trump over border security should be separate from passing a federal spending bill to end the three-week long partial government shutdown.